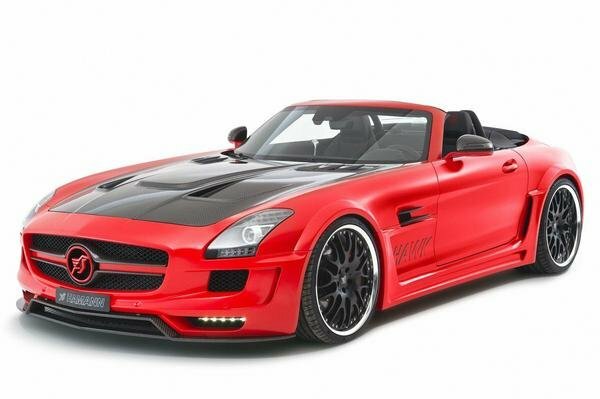 A year after Hamann wowed the Geneva Motor Show with their program for the Mercedes SLS AMG called the "Hamann Hawk", the tuning company is coming back with the drop-top version of the Mercedes supercar. It’s been no secret as to how adept these guys are with Mercedes vehicles and this program for the SLS AMG Roadster is no different. Aesthetically, Hamann fitted the supercar with the usual aerodynamic enhancements, including a front apron that replaces the serial bumper and a new LED light set-up. The SLS AMG Roadster also gets enlarged air inlets that provide more fresh air to the engine. There’s also a new bonnet made of checkered flag carbon, wider wings that add 60mm on the front side and 70mm on the rear side, new side skirts, a new rear apron with a matching diffuser, and a new set of 21" Unique Forged Anodized light forged wheels.